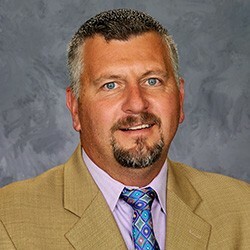 Mr. Andrew Fetchik III is the current principal at Mentor High School and was the principal at Chardon High School on February 27, 2012, the day of the shooting that left three students dead and three others injured. Mr. Fetchik was front and center throughout that tragic day, assisting all law enforcement agencies, school personnel, administrators, students, and parents through one of the darkest days in our nation’s school history. Because of his actions that day and his leadership in the months following the shootings, Mr. Fetchik and Chardon High School received the Governor John Kasich Award for Courage. He has also received the Close-Caputo Educator Humanity Award. Mr. Fetchik is a graduate of Cleveland State University and received his Master’s degree from Ursuline College. He also has his Superintendent Licensure from Ashland University. Mr. Fetchik was named Ohio’s 2015 High School Principal of the Year by the Ohio Association of Secondary School Administrators (OASSA). He is on the Board of Directors for the OASSA and a member of the National Association of Secondary Principals. Andy Fetchik left his Chardon High School principal post in June of 2016 and is now principal of Mentor High School in Lake County Ohio. His presence is missed in the hall of Chardon High School. The Chardon community is is deeply indebted to Andy and the leadership he has shown thru a very difficult time at Chardon High School. Mr. Fetchik and his wife Julie reside in Munson Township with their three children, Drew, Heath, and Aubrey.